"One of the things that drew me here was the culture of service and civic engagement, specifically service learning." "Being able to be a representative of IUPUI, this great university that is very different from a lot of places, kind of ahead of the game -- it was really neat to be able to spread that word on a national level." All we asked four years ago was for Kriech and her fellow Jags to give us their best. Kriech was selected from approximately 4,000 IUPUI seniors as the student speaker for their commencement ceremony, to take place Sunday. She will join featured speaker Tamika Catchings, who played her entire 15-year professional basketball career for the Indiana Fever of the WNBA, onstage. To deliver the address at commencement, the student must have a successful academic record. Kriech will earn her bachelor's degree, with honors distinction, in organizational leadership and supervision with minors in business and sociology and certificates in technical communication and human resources management -- and a history of campus and community involvement. To separate academics and cocurricular engagement and still reach the same level of achievement would have been impossible for Kriech. It was a concept reinforced by her advisor in the School of Engineering and Technology, Elizabeth Wager. "The first thing my advisor told me when we met is that this is a leadership degree," Kriech said. "You take leadership of your degree and make it what you want." So over the ensuing four years, Kriech combined classes in global leadership, ethics and project management with leadership positions on campus. She has served as vice president of membership for the Student Organization for Alumni Relations as well as director of entertainment speakers and vice president of external affairs for the Student Activities Programming Board. Having taken advantage of the RISE program, an initiative that challenges students to include research, international experience, and service and experiential learning in their degree programs, she became a member of its steering committee and encouraged others to do the same. That's another theme in Kriech's career: building opportunities for others to enjoy the same success she has had. 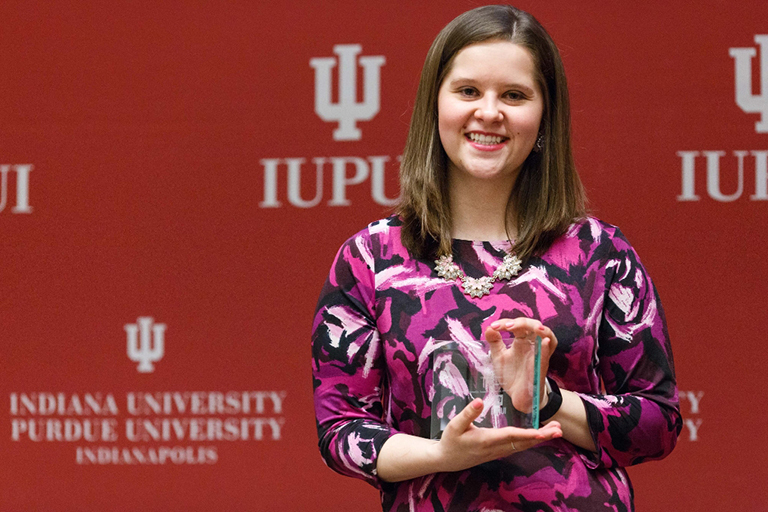 She developed two courses at IUPUI, including an upper-level grant-writing class based in part on her experience as a member of the State Farm Youth Advisory Board. In that position, which is what she was recalling when she lauded IUPUI for being ahead of the service-learning game, she helped to award $10 million over two years for youth projects across the U.S. and Canada. Kriech later created a peer-mentoring program. This effort pairs first-year students in the organizational leadership and supervision program with those at the senior level and alumni. "A class has come out of that," she said. "It's a service-learning course for the leadership team of the peer-mentoring program. It came from my own experience as well as a passion and an understanding of how important that can be for students. "It's also what I used for my capstone project, specifically looking at the benefits mentors receive from the experience and how they apply classroom material and develop an understanding of their individual leadership style." Being able to be a representative of IUPUI, this great university that is very different from a lot of places, kind of ahead of the game -- it was really neat to be able to spread that word on a national level. In the midst of all this, she also studied abroad in Germany, was a 500 Festival Princess in 2016, served as a peer mentor and leader in the IUPUI Honors College, and completed four internships. She'll add a fifth this summer, developing compensation and benefits processes, while gearing up for graduate school studying medical sociology at IUPUI. Kriech is a Bepko Scholar, the most prestigious scholarship awarded in the Honors College; a two-time Top 100 honoree; and a recipient of both the William M. Plater Civic Engagement Medallion and Women's Leadership Award this spring. In 2015, she received the Mayor's Diversity Award for Youth Service. The main thing on Kriech's mind right now, though, is that speech. Unlike most who are about to address thousands of people, she's not even a little bit nervous. As someone who actually loves public speaking, the opportunity proved too enticing to pass up. "I think what really caught my attention was being able to represent my department, my school and the university," she said. It's kind of three different levels of giving back to this university that has given me so much, as well as the opportunity to give a good message send-off to my fellow graduates." Commencement begins at 1 p.m. on May 14 at Lucas Oil Stadium. You can find more information about the ceremony, travel information and watching live online at commencement.iupui.edu.